In case you haven't heard, fall is my favorite season, but in Georgia, true fall days are few and far between. Which is why when stores release their "easing" into fall collections, I get so excited. They are the perfect mix between summer and fall, and I can wear them without a. feeling like I am not dressing for the season or b. sweating. Usually I love Vineyard Vines' men's collection way more than the women's, but lately, their women's stuff has been so on point. I am in love with every piece they've released so far, but here are my favorites. The Knollwood Stripe Dress combines everything I love... Dresses and stripes. I love the navy and white one (of course), but I think the navy and green would help expand my striped wardrobe more. Vineyard Vines released a gingham Harbor Shirt last year, and I was pretty sad that I didn't get it. Thankfully, they brought it back in a my favorite color: royal blue. Fav colors. Different than any thing I have. The Tri-Color Crewneck Sweater is calling my name. Loudly. VV has brought scallops back, and I love the dress and oxford shirt. 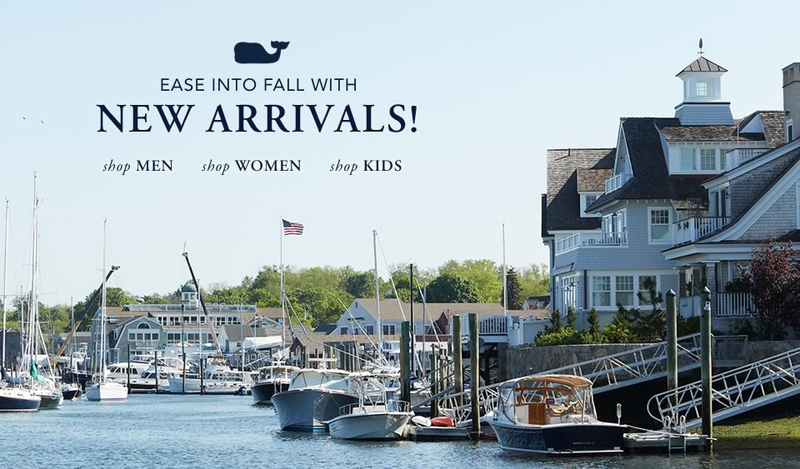 Before I list everything on the site, I will stop now, but be sure to check out Vineyard Vines' new arrivals if you haven't already!